In connection with the year 2019 having been declared the “Year of Stanisław Moniuszko” by an act of the Polish Parliament, the Polish Composers’ Union and Teatr Wielki – Polish National Opera hereby announce the International Stanisław Moniuszko Composers’ Competition for a micro-opera. The competition may be entered by music composers of all nationalities and without an age limit. Entering the Competition is free of charge. The entry submitted to the Competition should be sent only electronically by the end of 31st July 2019. The Competition consists of two Stages: in Stage One, maximum six Works will be selected to be staged in the Emil Młynarski Chamber Music Hall of Teatr Wielki – Polish National Opera in Warsaw; in Stage Two, the Works selected for production will be publicly performed during one Night of World Premieres on 14th December 2019, after which the winners of the Competition will be chosen. The winner of the Competition shall receive a Grand Prix amounting to 40,000 PLN and the title of Winner of the Competition. The other composers of works staged during the Night of World Premieres shall receive Prizes amounting to 20,000 PLN each and the title of Prizewinner. Independently of the prizes listed above, the Teatr Wielki – Polish National Opera Audience Award, amounting to 10,000 PLN, shall be presented, accompanied by the title of Audience Award Winner. Warsaw | I International Music Festival of Central-Eastern Europe "Eufonie"
11 concerts during 9 days in 5 concert halls. World-famous soloists and European orchestras. The Polish Composers' Union invites to the 1st International Festival of Central-Eastern Music 'Euphonie', which will take place from November 23 to December 1, 2018 in Warsaw. During this year's edition – organized in the special year of the 100th anniversary of Poland regaining its independence – we will hear, among others, works by Karol Szymanowski, Krzysztof Penderecki, Béla Bartók, Henryk Mikołaj Górecki, Antonín Dvořák, and Arvo Pärt. There will be two premieres of works commissioned by the organizers: Catalog of Trees by Michał Jacaszek, Virpi Pahkinen and Thomas Strønen, and DoubleCelloConcerto by Hanna Kulenty. Among the performers: Zoltán Fejérvári, Laurence Foster, Aleksandra Kurzak, Félix Lajkó, Anne-Sophie Mutter, Leonard Slatkin, Akiko Suwanai, and outstanding orchestras: National Polish Radio Symphony Orchestra, National Philharmonic Orchestra, Sinfonia Varsovia, Tallinn Chamber Orchestra, Budapest Festival Orchestra. The Festival will be accompanied by the International Musicological Conference "National identities – European universality. Music and musical life in Central and Eastern Europe (1918-2018). " The festival is organized by the National Center for Culture thanks to funding from the Ministry of Culture and National Heritage. The partner of the Festival is the Polish Composers' Union. President of the Polish Composers' Union and director of POLMIC Mieczysław Kominek is the chairman of the programme board. 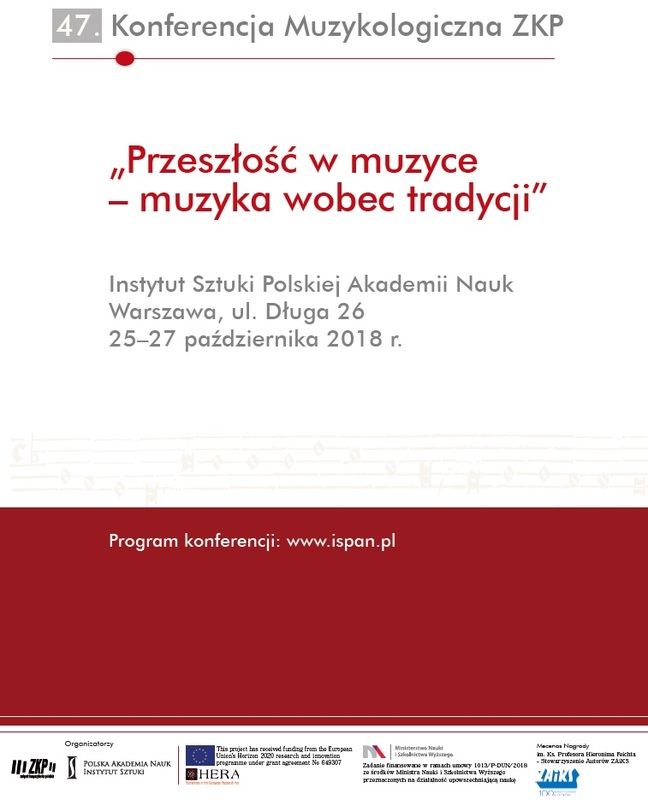 Warsaw | 47th ZKP Musicological Conference "The Past in Music – Music towards Tradition"
On October 25-27, 2018, at the Art Institute of the Polish Academy of Sciences in Warsaw (26 Długa Street) will host the 47th Musicological Conference of the Polish Composers' Union "The Past in Music - Music towards Tradition". The year 2018 is also the 70th anniversary of the Section of Musicologists of the Polish Composers' Union, therefore all of you are cordially invited to take part in the conference. 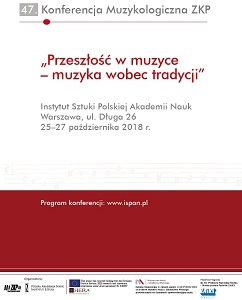 The first panel session will be devoted to the history and present, and will feature Katarzyna Dadak-Kozicka, long-term chairwoman of the Musicologists Section, the author of the book Obrońcy dobra powierzonego, which talks about the beginnings of the ZKP and the Musicologists Section; Iwona Lindstedt, editor-in-chief of "Polish Musicological Yearbook," and Sławomir Żerańska-Kominek, editor-in-chief of "Musicology Today". The conference participants' lectures will also be devoted to issues in the history of music as well as etnomusicology, anthropology and sociology of music, incorporated in two complementary thematic areas, announced with the title of conference. The first one concerns various forms of the presence of music of the past in the culture of a given period, the second – the relation of music to a tradition identified with a given musical genre, a center, a region or a social group. The conference is being prepared by the Program Committee composed of Agnieszka Draus, Paweł Gancarczyk, Barbara Przybyszewska-Jarmińska and the chairwoman of the SM ZKP Beata Bolesławska-Lewandowska. The conference is organized in cooperation with the international research project HERA "Sound Memories: The Musical Past in Late-Medieval and Early Modern Europe" (www.soundme.eu). The project is financed under contract 1013 / P-DUN / 2018 from the funds of the Minister of Science and Higher Education designated for dissemination of science. A concert from the series "Generations" – Generations XXI – will be held on October 28, 2018 at 6.00 p.m. at the Witold Lutosławski Polish Radio Concert Studio. Concerts from the "Generations" series are organized by the Polish Composers' Union in cooperation with the Polish Radio Programme 2 and the ZAiKS Authors' Association since 2003.  They present works of various Polish and foreign composers of the 20th and 21st century generations, artists who have been forgotten or badly represented, orchestral debuts, and premieres performed by experienced musicians. During this year's 21st edition, we will hear such works as: Dziewczyna o płowych włosach for orchestra by Edward Pałłasz, Concerto for Accordion and Orchestra by Zygmunt Krauze who celebrates the 80th birthday this year, Fantasia luminosité for violin and orchestra by the Korean composer Eunho Chang, graduate of the FCUM. In addition, the concert will feature the world premiere of Duet → Solo for orchestra and electronics by Piotr Roemer and Parada Concerto for percussion and orchestra by Jan Oleszkowicz. Both works were written within the "Composing Commissions" programme, operated by the Institute of Music and Dance. Among the performers there are accordionist Maciej Frąckiewicz, drummer Miłosz Pękala, violinist Agata Szymczewska and Polish Radio Orchestra under the baton of Michał Klauza. Concert organized by the Ministry of Culture and National Heritage as part of the "Music" programme and the "Composing Commissions" programme and co-financed under the support programme of the German Music Competition – a project of the German Music Council. The patronage over the concert was taken byPWM Edition as part of the TUTTI.pl project, promoting performances of Polish music. A concert on the occasion of the 100th anniversary of Poland's independence will take place in the Óbudai Társaskör concert hall in Budapest on 4 November 2018, exactly one week before the National Independence Day in Poland. The event is co-organized by the Polish Composers 'Union and the Hungarian Composers' Union. The Hungarian Anima Musicae Chamber Orchestra under the direction of renowned conductor Mátyás Antal will perform Polish music of the 20th and 21st centuries. 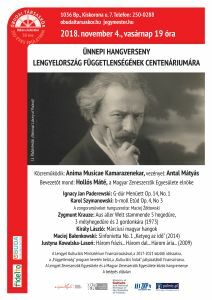 The foreword will be delivered by the President of the Hungarian Composers' Union, Máté Hollós. The programme of the concert includes: Ignacy Jan Paderewski – Minuet G Major, Op. 14, No. 1, Karol Szymanowski – Etude B Minor, Op. 4, No. 3 (both pieces arranged for string orchestra by Maciej Źółtowski), Zygmunt Krauze – Aus aller Welt stammende for 5 violins, 3 violas and 2 cellos (1973), László Király – March Hungarian Sounds, Maciej Bałenkowski – Sinfonietta No. 1 „Time is Ticking” (2014), Justyna Kowalska-Lasoń – These phrases... These songs... These arias... (2009). Admission free! The project is financed from the funds of the Ministry of Culture and National Heritage under the Multi-annual Program INDEPENDENT 2017-2021, as part of the subsidy program of the Adam Mickiewicz Institute "Cultural Bridges".